A few weeks ago, BabyC and I went through a rough patch. She was not that interested in playing independently. Before this, it seemed that her best play happened when I was present but not involved. What do I mean by “best play?” I mean the kind of play where she is totally engrossed and focused on a task that she designed. When she’s in charge of her play, it seems to hold her attention for the longest. I love playing with her, but I’m not nearly as creative as she is when it comes to figuring out all the many things one can do with an everyday object, and I’m afraid that I get bored and try to move her to a new task too quickly. BabyC, on the other hand, can dig through the recycling bin (I’ve learned to be selective about what I put in there) and come up with a toilet paper tube, a used yogurt container, and a milk jug and have all the tools she needs to keep her busy for an hour. One of her favorite projects has been containers with tops – taking them off, putting them on, putting objects inside, shaking, opening, taking out, putting in… she’s even started to get the hang of screw tops. Anyway, back to our rough patch. For a couple of weeks, BabyC was really whiny. Husband finally helped her learn to say “Up!” when she wanted to be picked up. That was a vast improvement over whining, but she was still following me around the house saying, “Up-up!” all day long. I practiced saying, “I’m fixing dinner right now. I can pick you up in 5 minutes,” but I also spent a lot of time holding her and trying to do tasks with one hand, which I’m sure you understand takes 6x the amount of time as doing them with two hands. I would try to engage her in playing with blocks or yogurt containers, but she seemed to be more interested in hanging on my neck. I started wondering if we needed to buy some new toys. Maybe BabyC’s old toys had just gotten stale for her and she was finally bored of the recycling bin. One day, we wandered into a really great toy store to peruse the selection, and I just felt overwhelmed. I want to be selective about choosing high quality, open-ended toys for BabyC. I don’t want our house to fill up with plastic junk that plays annoying digitized songs. We probably spent an hour playing in this toy store, which was a great activity for a rainy afternoon, but we left without buying anything. A few days later, we made a family trip to a thrift store. Husband was trying on clothes, and BabyC and I were checking out the hats and purses. BabyC found a wallet and fell in love. She didn’t want to give it up when it was time to go. We realized that she had actually chosen a great new toy for herself, so we bought it. I remembered seeing a My First Wallet toy at the toy store, but this one was both higher quality and cost less. Why buy a toy when you can buy the real thing? I shouldn’t be surprised that the wallet is BabyC’s favorite new toy. I occasionally let her play with my wallet, and she thinks it is the best thing ever. The thing is, my wallet is really very important to me, so it doesn’t make a good toy at all. BabyC’s new wallet is a perfect toy. It is made of fabric. It has several slots for plastic cards, so we’ve given her Mama’s old Arizona driver’s license and a few outdated store club cards. She loves practicing pulling out the cards and putting them back in. 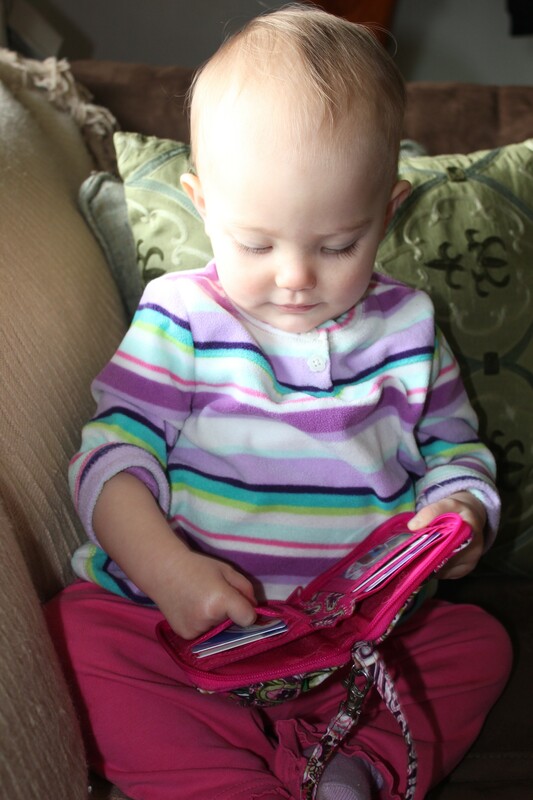 The wallet has two zippers, which she’s still learning to operate. It has a pocket with a snap, made to hold a cell phone. This perfectly fits one of BabyC’s blocks, which she regularly uses as a phone anyway. This thrift store purchase has literally resulted in hours of entertainment for BabyC. Meanwhile, BabyC has returned to her old ways of deeply-engrossed independent play. In hindsight, I realize that her neediness was probably all related to the fact that she was teething and had a minor cold, both of which combined to mean that she was a little short on sleep (as was I). She didn’t need more toys, she just needed more of Mama. That’s absolutely fine, but I’m glad it wasn’t a permanent situation. A few days ago, BabyC discovered a stack of paper cups, and these have become her new favorite toy. She stacks and unstacks. She moves them, one at a time, from one end of the room to another. She fills them up with blocks and pours them out. I watch. Happily. BabyC doesn’t seem to care if she is playing with something purchased from a toy store or a thrift store or something upcycled from the recycling bin. So, I’m holding off on buying new toys for the time being, but I’m still on the lookout for good ones. I want the kind that are open-ended and will encourage building and creative play. What are your favorite toys for toddlers? I love Melissa and Doug!! I also like toys that the HABA company makes. They make some incredible board games for preschoolers…..my favorite is The Orchard – floor version. My girls have also had fun making a grocery store out of boxes and containers from our recycling bin!!! I got a shopping cart at a garage sale and gave them some old purses and wallets with fake money from the dollar store. They have the best time with that store!! I love the store idea! Sounds like your girls play well together, too! My wallet is among W’s favorites; I’ve been planning to make her up a “dummy” wallet (just as you did for BabyC) for some time now! She loves my headphones, but she’s not allowed to have them because the ear pieces come off and are the perfect size to choke on. By making them “forbidden fruit,” I’ve made them irresistible, though. Lip gloss, chapstick. One of those dumb little makeup bags that comes free with Clinique purchases every now and then. We call it her “purse,” and she carries a container of face lotion with a screw cap (that she’s learned to take off, but not put back on yet) in it. Basically, anything she sees me using, or that looks like something I use. She’s WAY into my phone, but isn’t ever allowed to have it. Still, she pretends all sorts of weird things are phones, and “talks” on them. Her favorite conventional toy is a water table. HIGHLY recommend! I’ve also been giving her tasks lately, which she LOVES. We pulled up some small rocks in the back yard to put down pavers, and she helped me put rocks in a bucket for the longest time. When I shop, I try to go places like Trader Joes that have little kid shopping carts, so she can push them around. She’ll push big carts too (by holding the bottom rail). If I buy something, she loves it if I let her carry the bag (if the bag is small). I use cloth shopping bags, but they’re too big for her; I’d like to find a little cloth bag so she can always carry something. She’ll carry the mail bag and keys to the mailbox when we go check it each day. AGH! I keep trying to comment and WP won’t let me! Sorry:( That’s the worst. But thanks for all of your ideas. Forbidden fruit is the worst. I don’t know any way around it, except for being consistent about forbidding it. BabyC’s current forbidden fruit is any food in the door of the fridge. I open it, and she grabs all she can and runs off with it. And she talks on the phone all of the time – a phone being anything that is remotely the right shape or size for a phone. I don’t get that. Neither husband or I actually talk on the phone much at all, but she finds it fascinating. As for tasks, lately I’ve been asking BabyC to put things away for me – dirty socks into the laundry, water toys in the bathtub, shoes on the shoe rack, etc – and then I check later to see where things actually end up. Sometimes she impresses me by doing something like setting my slippers just so by the side of the bed. Sometimes things end up in really weird places, but it keeps us both entertained. Sorren spends lots of time drawing. One crayon at a time. He will work on a paper for an hour or more. He chooses a color and off he goes to draw little squiggles and odd shapes. Wow, that’s so great. BabyC hasn’t really gotten into drawing yet. I think we’re finally past the eating crayon stage. I gave her some crayons yesterday and she spent 20 minutes taking them out of the box and then trying to fit them back in, but not doing much drawing. I’m looking forward to art time! Colored clothes pins – you can peg them onto sides of containers. My daughter loved doing this over and over. They are also great for posting into containers and tipping out again. A store bought toy she really loved was a wooden fruit and vegetable set – the one where they are in slices and attached by Velcro – she loved ‘cutting’ the fruit and vegetables with the wooden knife and putting them back together again. When my son was little all my tupperware went missing. Found it in his room! He loved the measuring cups. Unfortunately he also liked Penaten Bum Cream. Smeared really nice all over the coffee table. Also liked boxes. and the cat. And my glasses on my face. My friends bright blue hat, he whipped right off her head. And his shoes, which he repeatedly took off tossed and repeated the show everytime you put them back on. Cleo loves the reusable grocery bags. She just walks around with them, doing laps around the house, looking like she’s on a very important mission, mumbling and grunting to herself. Sometimes she gets her head and one arm through one of the handles and looks even more official. BabyC does a lot of mumbling while she plays, too. And lots of missions. I love it. We usually chose toys that did nothing, or very little. S is older than babyc, but at that age it was containers, anything we did, paint brush and water etc, babies, beans and measuring cups, books, push toys. Also second the water table! Now we’ve moved on to more conventional toys like blocks and plasticky things- she loves to tell stories and play pretend with her fp little people. We still try to stick to low tech, multipurpose toys but we sometimes fail. I’ve found the best thing to buy time is the sink and cups or letting her ” cook” on a chair with noodles, water, measuring cup wooden spoon. It’s true, toys are kind of a waste! “Cooking” is definitely a hit with BabyC right now. I think we may invest in a water/sand table for the summer. I think she’d like that, and it would fit in our small outdoor space. Boxes. Any size works for my kiddos! They’re 4 and almost 2 and boxes really bring out their imagination. They can spend over an hour playing with one cardboard box. An old wallet is brilliant!! Maggie loved (still does) measuring cups & spoons. Her favorite is when I also give her a bowl of uncooked rice or cotton balls or water – basically anything to scoop. The other day I took an old container and cut a slit in the top and gave her some change to put in the slit. Hours and hours of entertainment. We try to be really selective, it fosters creativity – plus it’s frugal!! Oh, and right now, W is playing with a container of wooden clothespins. I treasure all the hand me down toys my friends give me. I haven’t bought my son a single toy or playard because of it. But I have also noticed he is more interested in me than anything else unless it’s a mirror…but he is only 22 weeks…soo I guess toys are not as fun as Mama. These are the only toys we have for five weeks: three stuffed animals, a pencil case of figurines, a toy airplane, three books and some crayons. He doesn’t seem to care a lick! He seems all the more attached to the few he has. He’s probably too busy taking in all the new sights and sounds! And carrying those water jugs! I bet that he’s found some new objects to play with as well. You’ll have to let us know what he adopts as toys on your trip. Silk playcloths if you can afford them. Otherwise 30″x30″ (and larger) pieces of fine cotton. Toddlers love to play peek-a-boo, wear them like aprons and costumes, play “ghost” and when they’re a bit older they can use them to make forts and scenery for toy animals. Great idea! I love things like this that can have endless uses. My daughter loves old cat toys. She started unrolling the toilet paper like a cat so I decided to pull out some of the old toys the cats are too lazy to play with. They have all been a big hit. One of my Grandma friends keeps little surprises and small toys in an empty Quaker Oats canister. Visiting Toddlers love taking the lid off, either dumping contents out for inspection or removing them one by one, then repeating the process back and forth as attention spans allow. The contents may be old favorites like measuring spoons and blocks, coupled with one little new thing to be discovered. They love it, and know right where to go to find the box at Grandma’s house! As someone formerly employed by the ‘toy industry’ I have to say how much I LOVE this post. So true! We are finding that what Hannah wants the most, she shouldn’t have – like the remote, my iPhone, the folder with Lucy’s shot records, etc. The ‘toys’ don’t seem to hold her interest like these. She will walk around all of the plastic just to find something else. It’s amazing. Struck a chord, loved it, keep up the good work! I’m not a mother, but I have 5 younger brothers, 2 nieces, & 1 nephew. I also babysit occasionally & work in our church nursery a lot. I have discovered that the number of toys available is very important. It’s so easy to — without realizing it — provide a child with more toys than he needs or wants. If kids have too many toys, they seem to just go quickly from one to another and not really play with any of them. However, give the kid a couple of toys that really grab his attention and he will be entertained for a while. Toys shouldn’t only entertain, though. They should also provide some new skill for a child to learn or practice. Despite what many people claim, a toy doesn’t have to be big or expensive — or even a “toy” for that matter — in order to teach and entertain kids. Sometimes the things adults would lable “boring” are the very things they thoroughly enjoy. Some favorites: wooden blocks — buckets or boxes — spons — dolls (yes, even for the boys) — cars — dumptruck — dirt 🙂 — animals (toy ones & real ones) — containers with lids — magnets — hair clips. My motto: Use your imagination & let the kids use theirs too. Magna Doodle has been one of my 23 mo son’s favorite toys. He will spend a half hour straight drawing and erasing on it. He is mostly passed the crayon-eating stage but doesn’t totally understand that he should only draw on paper, so this is a great substitute when I cannot devote a ton of time to sit with him while he draws. We also save big cardboard boxes when we order things (recently it was a new motorcycle jacket and pants for my husband and a double stroller). We took the two boxes, cut out doors and windows and made a train out of them. Then we decorated it with crayons and stickers. He has had his snack in it every day for two weeks and plays for the longest time in there. Any toy becomes new and exciting once it makes it’s way into the train. BTW, I love the wallet idea. I’m stealing this immediately. I’ve been trying to resist the urge to always BUY new toys (some are just so cute! )…and instead repurpose things for my toddler to play with. I know that she will ultimately be more likely to use her imagination if I do, and my house will look less like a daycare! Thanks for the insight & inspiration.